Islam Around Us: More chaos as Kashmiris boycott India polls. 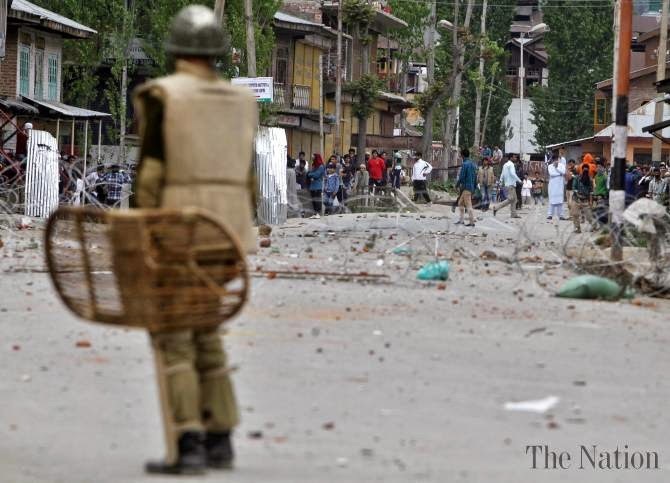 SRINAGAR | The Nation | 07 May 2014 : : A bomb blast near a polling booth in Kashmir injured a policeman today, amid further stone-throwing protests and a widespread boycott of India's general election in the mainly Muslim region. Separatists have called on voters to shun the election in India's northernmost state of Jammu and Kashmir, holding staggered voting in its six parliamentary seats to allow 700,000 army troops and police to mount a mobile security operation. The bomb exploded outside a polling station at a village in the Baramulla constituency, one of two voting today in northern Kashmir, injuring a police reservist, police said. There were numerous reports of protesters throwing stones at police and election officials in the valley. A bomb was also thrown at a police station the Baramulla district, but no one was injured. Only a quarter of voters have turned out in Jammu and Kashmir so far in the five-week election, in a show of passive resistance to rule from New Delhi and concern over a likely victory by Hindu nationalist Narendra Modi and his Bharatiya Janata Party (BJP). Kashmir has been a source of strife since British India was divided into independent India and Pakistan in 1947, with many Kashmiris, and Pakistan, saying the region should have been part of Muslim Pakistan, not Hindu-majority India.